Is the smart TV market on the decline? If the current TV market is anything to go by, the answer may be yes. Then, will Tizen, Samsung and Intel’s open source mobile operating system, be able to turn the tide? 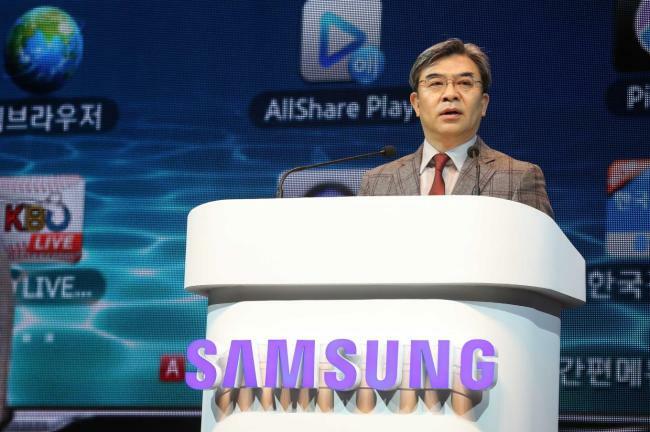 Kim Hyun-seok, head of Samsung Electronics’ visual display unit, appeared to be stumped for an answer. The executive looked visibly rattled and was silent for several seconds before he said he was unable to comment. Kim was among the high-profit TV and related industry figures and representatives who participated in the Smart TV Global Summit 2013 held at Renaissance Seoul Hotel on Thursday. Possibly reflecting Samsung’s concerns about the rut it has hit in the TV market, the vice president said later in the day that Samsung’s Tizen-operated television won’t be released until the Tizen smartphone is launched. “We’ve seen much progress in the Tizen TV, but the phone will come first,” Kim said. The Tizen phone, which was expected to be released early this year, has been forecast to be pushed back to next year ― meaning it will be quite a while before the Tizen TV comes. Even then, there is no telling how much of a paradigm change we may see in the TV market. Tizen is an open-source operating system being co-developed by Intel and Samsung, but in many ways, the technology is being used as a business strategy: For Samsung, Tizen is the sole alternative to Android by Google, while for Intel, Tizen may be a way to forge a closer alliance with Samsung. Imad Sousou, vice president of software and services at Intel said in a presentation at the conference that open source was the answer for spurring smart TVs. Others said while smart TVs may eventually catch on, the process will take a long time. “It will take at least a decade for the transaction (from set top boxes to smart TVs) to fully happen,” said Matthew Feinstein, senior product manager at Cisco. Industry data shows that while smart TVs will account for one-third of flat panel televisions this year, with the volume reaching 100 million units, peple actually using smart TV content are still only at about 10 percent of total TV users, according to Strategy Analytics.